After making two marksman cosplays without any sewing knowledge, I decided I have to try something really challenging and new for me. Something totally different, that would push me to use a sewing machine and won't be any badass armoured character like the two previous ones. 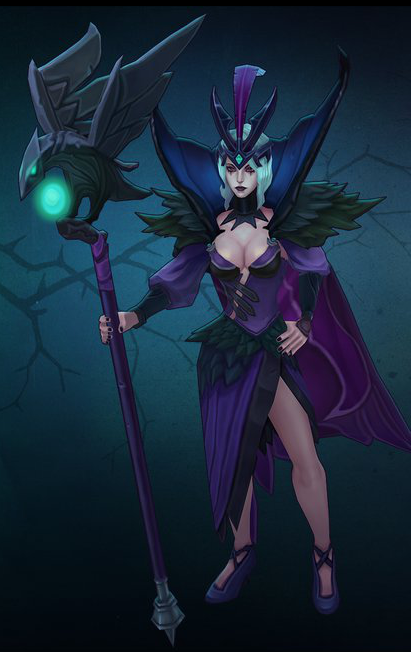 And when I saw this model from League of Legends, I was stunned. 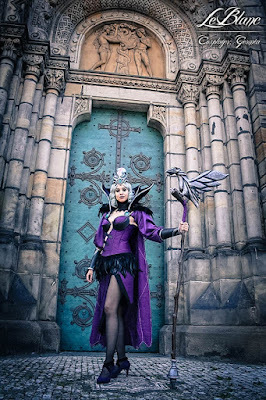 It was seductive, pretty dark, but not totally black/grey/red as my usual picks are, there was a lot of sewing, work with feathers, real challenge with big collar, that should stay in place and it has white (kinda greenish) hair and I just love white hair. LeBlanc as a character is something new for me, she's kinda hard to play for a noob like me, but she's really powerful, fun-to-play and pretty cheeky if you ask me. How could I resist? As usual I've done a lot of searching if there are any previous cosplayers of this particular character with this particular Halloween skin. Looking at other cosplayers makes me think of how could I do this and that and if I don't like something, it makes me think of a better ways how to do it. 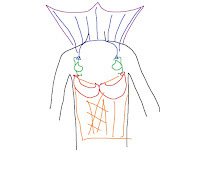 The corset is made out of two parts, that should be connected by black stripes and show your skin a little. But as I looked at other cosplayers, the gap was only damaging the shape of the whole corset. So I've decided to use a skin-toned fabric (that i bought in second-hand store), to fill the gap. 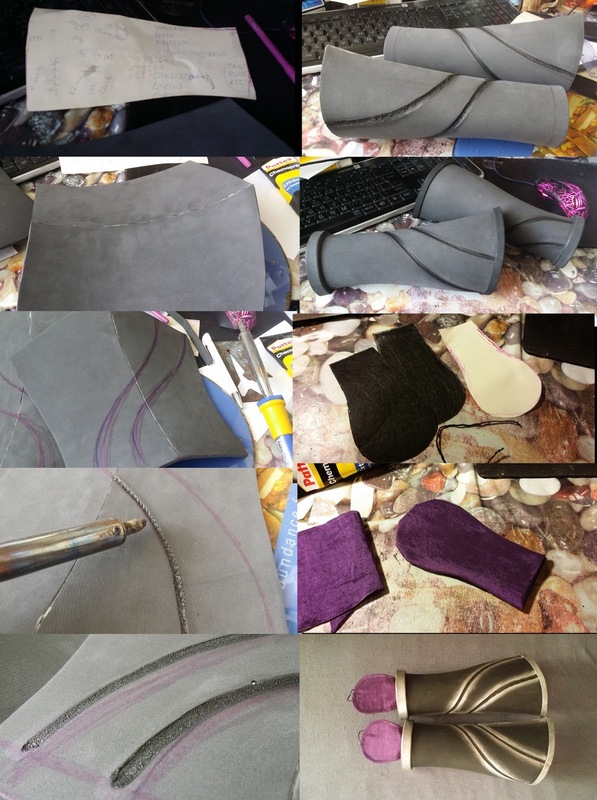 I´ve made the shape of the corset from paper to fit my body, then transfered the pattern onto the black unwoven fabric and purple taffeta fabric (taft). 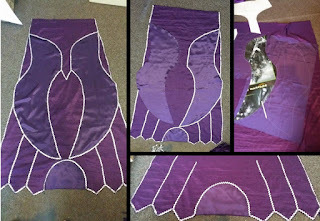 I´ve glued the taffeta borders to the black fabric and sewn all the corset parts together. 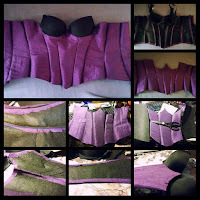 I´ve reinforced the seams with black plastic corset mountings. I´ve sewn a black bra into the corset. Everything is hand-sewn. 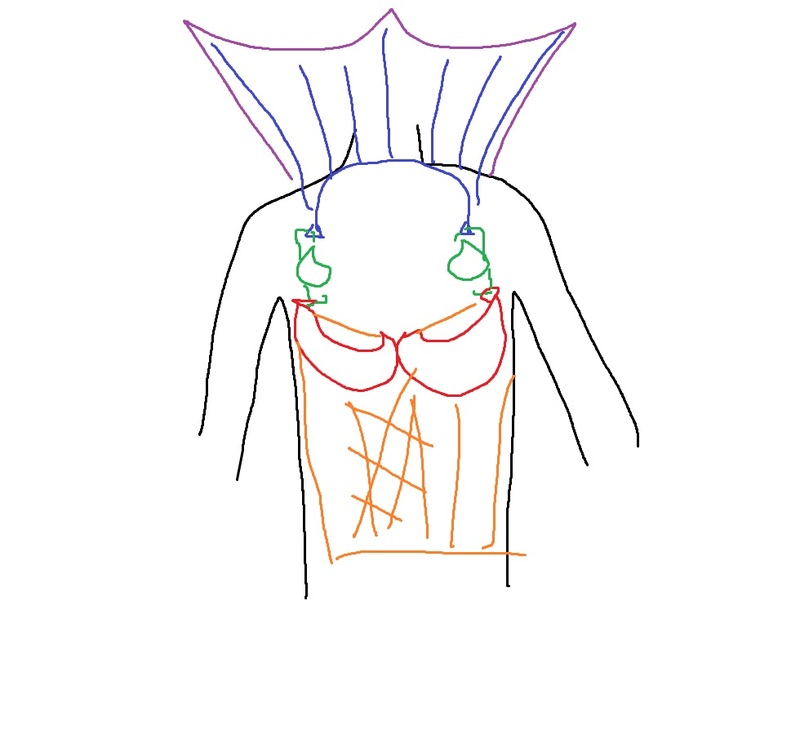 As I´ve seen some LeBlanc cosplays, that tried to make a corset with blank space on the front side like on the model and it never looked good just because the corset can´t hold its shape when space without fabric included. So I´ve decided to buy a fabric in the same color like my skin and sew it on my corset. I´m pretty happy with the result.The second thing I didn´t want to do like other cosplayers do is to use satin for the whole thing. Satin is a nice fabric, but if overused or not well sewn, it looks cheap and the whole cosplay seems clownish. So I´ve found a taffette, that looks great and doesn´t "shine" so much.The brooches are made from metal with jewellery technique tin soldering. Materials used: nonvowen black fabric for lining, purple satin for folded bra, stretch black leggings, that looked like leather for bra and brooch straps, sew-through púlastic corset reinforcements, black bra, purple taffette and beige shirt. 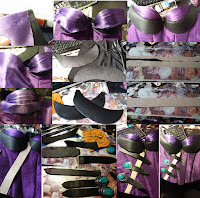 I´ve noticed, it´s one of the hardest parts of this cosplay - it shouldn´t move, it should be big, it should hold its form... How to do that properly I´ve learned from Mowky cosplay - she inspired me with her collar construction. The inner part is made from yogga mat rolled into rolls The mat is then covered in worbla thermoplastic material and shaped properly in heat. 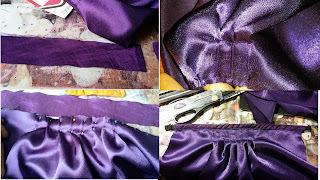 I measured the gaps between each part of the collar and transfered the paper patterns onto dark purple velvet. 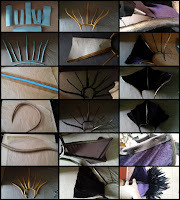 Each side has three parts, that are sewn togethet and glued on the constraction with hot glue. That was made from both sides and the upper parts was overcast with black fabric piece. The whole construction has been painted black and then silver with my sponge painting technique. Everything was measured and formed to fit on my neck. On the bottom part I made two eyelets for the brooches to fit in. The bottom feather collar was glued to the bottom part of this collar and fastened with wires. 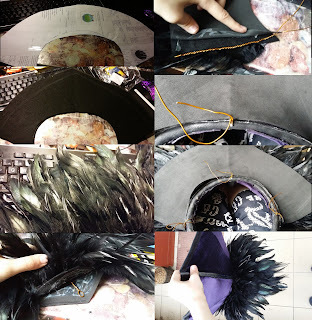 Bottom collar with feather is made from 2mm black craft foam supported with copper wires, that go through the worbla pieces. 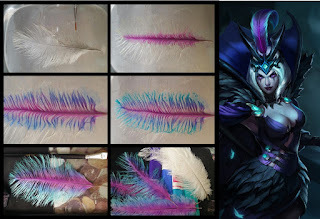 Then i took feather stripes from black rooster (I chose these because of the greenish effect on the light, that they make) and glued them with hot glue on the craft foam. I've bought single feather bundle for the blindspots to fill. Thanks to the wire the collar can be shaped at will. The whole skirt is made out of black felt, and the same purple taffete like the one used for the corset. Then I've used a decorating black ribbon, for the stripes. 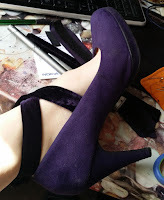 I've made straps from the leftovers from dark purple velvet with black rubber sewn inside and black velcros, that go together on the back of the leg. They're not sewn into the shoe. The shoes I bought from the e-shop of used clothes called vinted.cz. I made a shape out of paper and tried it on my hand if it fits. I cut the shape out of EVA foam. 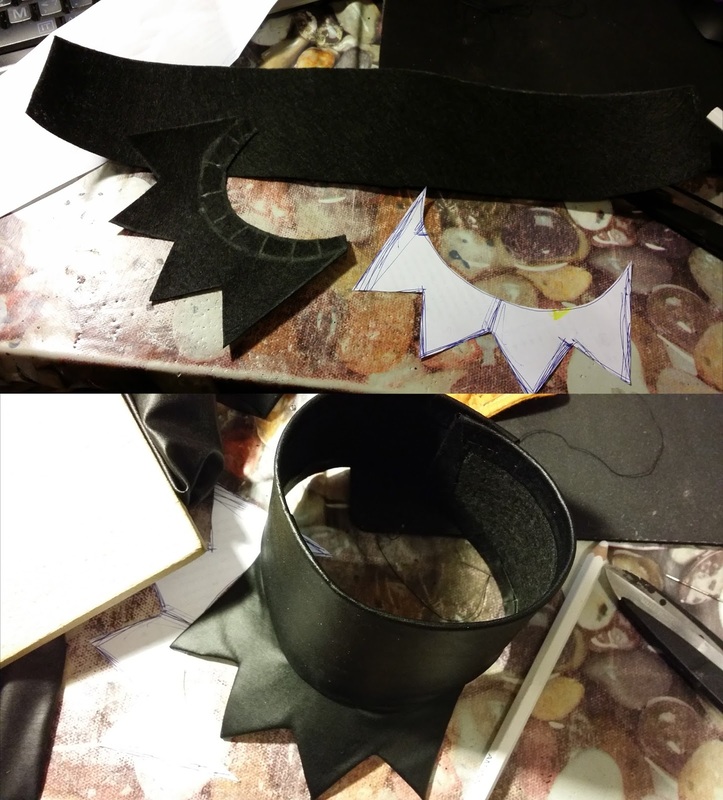 I glued the outer side of EVA foam together and drew 2 lines, that should be marked in the foam. I used my soldering iron for drawing the lines into the foam and glued the piece together from both sides. I made upper border from moosgummi and lower border from EVA foam (thicker) and dremmeled them to be smooth. I painted the whole thing with black and silver acrylic colors and sealed with laquer. 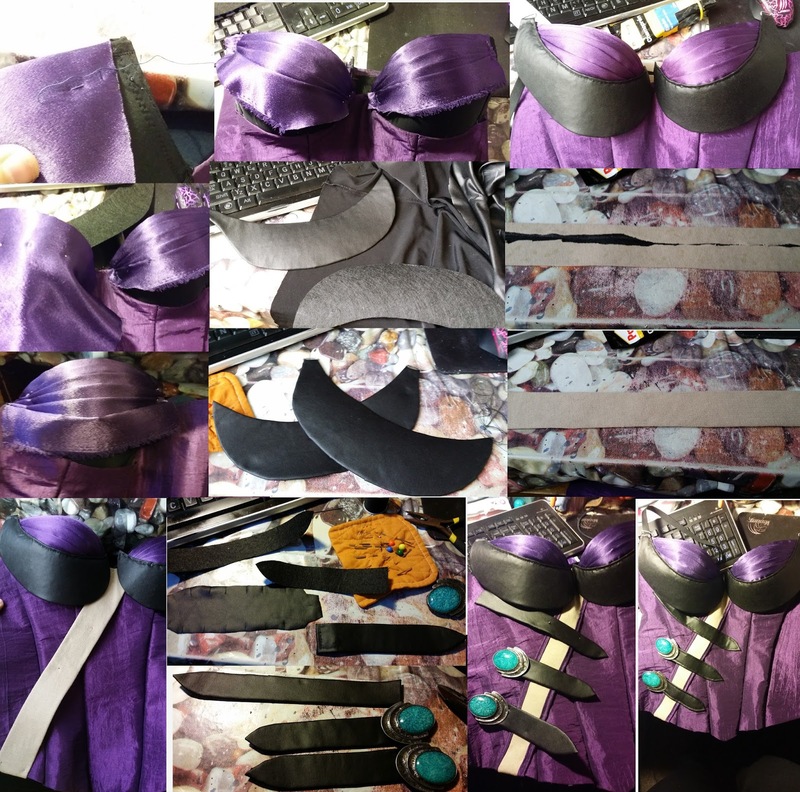 I made two "paws" from black and purple fabric and black rubber (attached to my middle finger), and sewed&glued it into the bracers. The tiara was made out of dremmeled EVA foam 0,5 thick and covered with worbla. For the blue gem I dremmeled a bezel in the foam and a small frame made of foam and worbla. Everything was connected together, because worbla sticks to itself easily when heated with heat gun. The I covered it in several layers of acrylic structure paste and painted it with black and silver acrylic colors. The tiara holds on the head because i made small eyelids on the inner part, where small hairpins could be placed. For the biggest feather, that is put into tiara, I bought some white big ostrich feathers. I put them on a platter and painted it with wet crepe paper (I tried painting it with acrylic colors, but it destroyed the structure of the feather - the color should be water-based), the let it dry. I've used purple, blue, cyan and green crepe paper. I painted more feathers just for the case. It holds in tiara by itself, there is only a small eyelet, so it needs a force to be put it and out of the tiara. 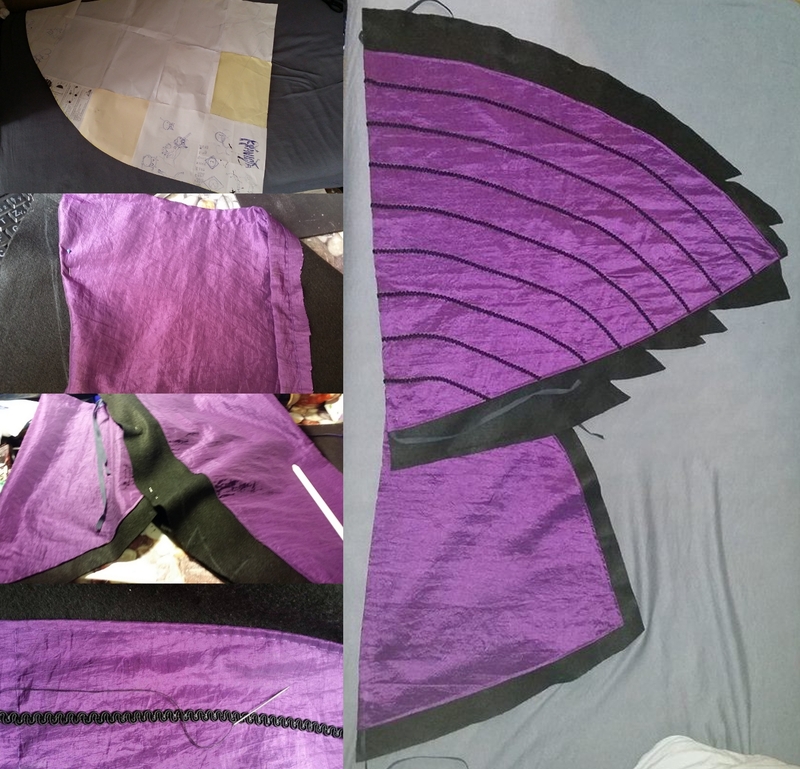 I wanted the sleeves to look good, so I´ve decided to fold the on the upper side and make them a little balloony like the in-game model has.I was afraid of using satin, because when not sewn good or overused, it looks really cheap. I think I´ve managed to avoid the cheap look by sacrificing a lot of time and work into folding of the sleeves and the sewin of their bottom part, where a small rubber strap is mounted. 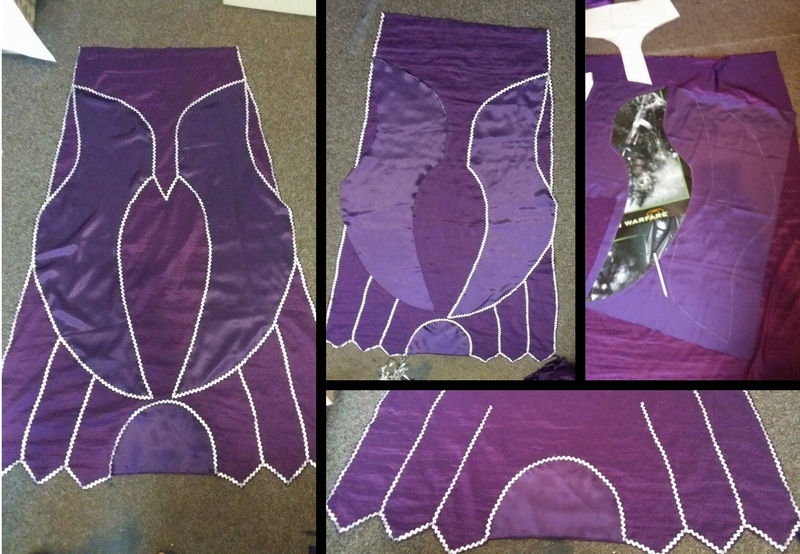 The cape was made out of purple taffete like the skirt and corset and decorated with the same satin, that I've used for the sleeves. The borders were decorated from both sides with simple silver lining. Everything was done with the help of paper patterns - for bigger projects like this, that need a bigger paper sheets, I use paper from old wallpapers. Gems - The gems I bought from local beadshop known for their high-quality glass and beads. I chose cyan blue glass beads with misty inner structure. Hair - I wanted to stay true to both splashart (white hair) and in-game model (green hair), so I've bought a wig, that was white with slight greenish tint from e-bay, that I curled wet with curling iron. For picture of the product I bought, see "material" picture. Neckpiece - I used the same fabric like for the straps and bra on the corset. It's actually made out of old leggings with leather effect, that I bought really cheap. Tights - I used two different tights for my photoshoot - For the first time I used simple skin toned tights, but i think black ones fit better to this costume. Contact lenses - I used purple toning lenses. For more info, visit please my LENSES TUTORIAL. Make-up - I used dark purple lipstick, light make-up, and purple and black eyeshades, the line under yes was made with black eyeliner. It´s made out of wooden stick found in a forest with the right shape for the staff. I had to cut it and sharpen the bottom of the staff. The raven was too big to hold on the smallest part of the staff, so I had to make it bigger and harder. 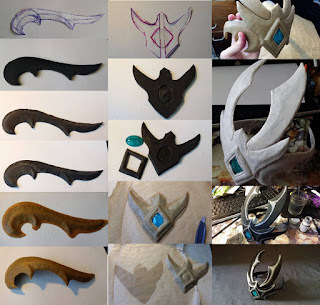 I´ve used yogging mat foam for the inside and worbla for the outside. It wasn´t necesary to have the worbla smooth, because i wanted to use cement for more reinforcement, that will cover upt he whole part. 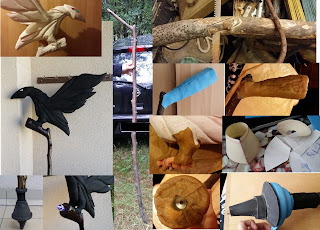 Worbla was important for the raven to hold on it and to fasten the led light screw into it. Then i´ve made out of moosgummi, yogga mat foam and EVA foam the bottom part of the staff (the decoration, i dunno). I´ve used cement to cover the whole upper part and drew the tree rings into it. Then I painted it with black acrylic color and the the whole wooden part with brown color for wood.The raven is made from polystyrene boards glued together. 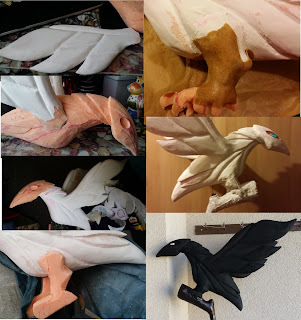 The body, wings and feet are made separately and then glued together with hot glue (any other glue melted the material - it was too agressive).I´ve carved it with exacto knife and smoothened it with acrylate cement used for walls. 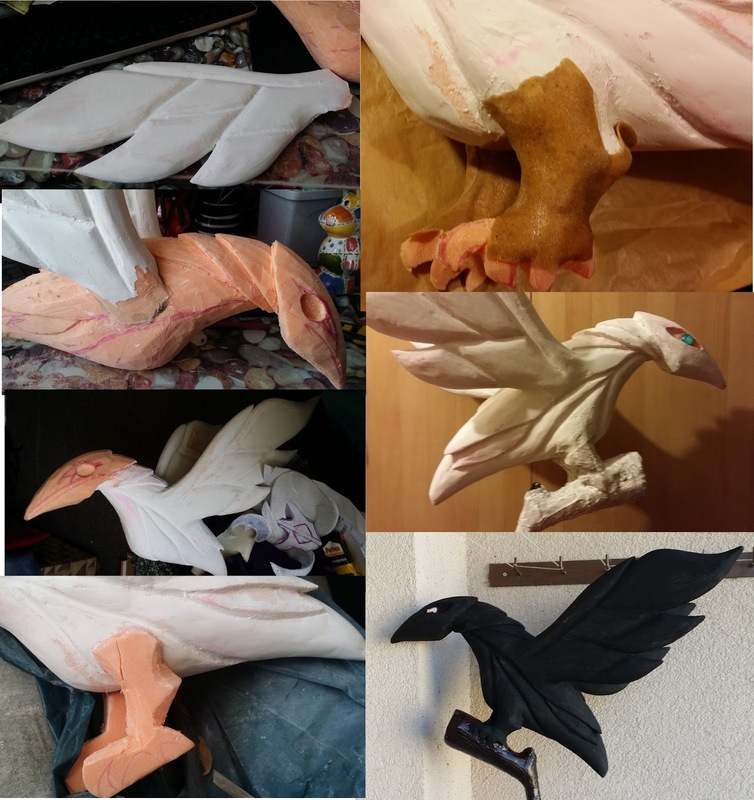 Then sanded and painted with black acrylic color.The hot glue wasn´t enough to hold the big raven on his small feet on the staff, so I had to use worbla to reinforce his feet.It´s not done yet. I have to make his eyes, moosgummi decorations and color shading into silver wit acrylic colors. Advantages:- With almost no armor, it's quite good for transportation and storing. - It attracts attention of children and small girls, because you're not scary, you're more princess-like. - You don't need any helper when you want to dress up in this costume. 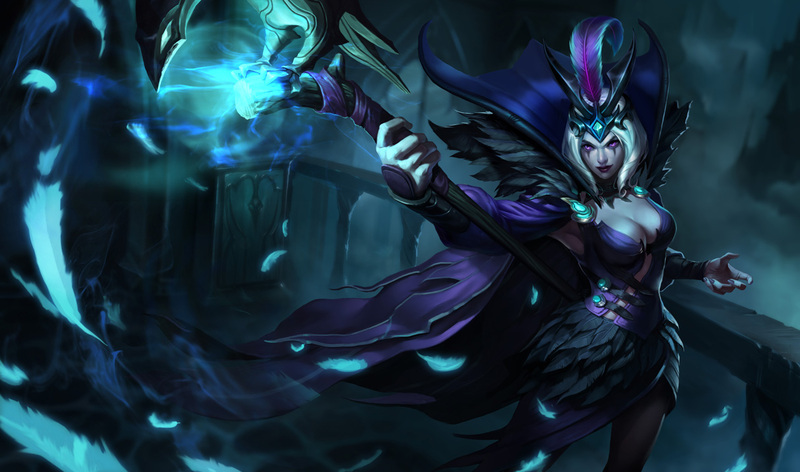 - It has almost no armor and the only prop is a raven, so it shows only a limited amount of skills. - It's too naked for winter and too hot to wear in summer. And if you like my work, I would be honored if you're interested in my other work too and like me on my facebook page HERE.